Following are some of the Different kinds of cement as per IS code manufactured to suit the different requirements. 1. Rapid hardening or high early strength cement. This cement gains strength faster than the ordinary Portland cement. Its initial and final setting times are the same as those of ordinary cement. It contains more of tri-calcium silicate and is more finely ground. It gives out more heat while setting and is as such unsuitable for mass concreting. It is used for such structures as are to be subjected to loads early e.g. repair of bridges and roads etc. It is more costly than the ordinary cement. It is manufactured by burning at clinkering temperature an intimate mixture of calcareous and agrillaceous material and grinding the resultant clinker without the addition of gypsum and not more than 1 per cent of air entraining agents. It sets faster than the ordinary Portland cement. Its initial setting time is 5 minutes and the final setting time is 30 minutes. It is used for making concrete that is required to set early, as for laying under water or in running water. Initial setting time being very little there is always the danger of concrete having undergone initial setting during mixing and placing. As such this cement is used only in exceptional circumstances. It not be used in locations where temperature exceeds 18ºC. It should NOT be mixed with other types of cements. For details refer to IS : 6452-1972. (i) It has lesser heat of hydration. (ii) It has better resistance to soils, sulphates of alkali metals, alumina and iron. (iii) It has better resistance to acidic waters. this cement can advantageously be used in marine works. Manufacture of Portland slag cement is aimed primarily at profitably utilizing blast furnace slag a waste product from blast furnaces. For details refer to IS : 455-1976. Heat generated by cement while setting y cause the structure to crack in case of concrete. Heat generation is controlled by keeping the percentage of Tri-Calcium aluminate and of Tri-Calcium silicate low. Its initial setting time shall not be less than 60 minutes and final setting time shall not be more than 10 hours. The rate of its developing strength is very slow. It is not very suitable for use in ordinary structures, when not only the use of structure shall be delayed but also the shuttering shall have to be kept for long and curing shall be prolonged. 6. Air entraining Portland cement. It is ordinary Portland cement mixed with small quantities of air entraining materials at the time of grinding. Usual air entraining materials used are resin, vinsol resin, oils, fats and fatty acids, Vinsol resin and darex are most commonly used. These materials have the property of entraining air in the form of fine air bubbles in concrete. these bubbles render the concrete more plastic, more workable and more resistant to freezing. However, because of air entraining the strength of concrete reduces and as such the quantity of air so entrained should not exceed five per cent. 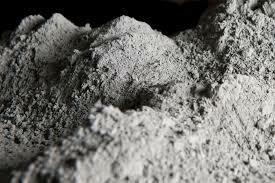 It is cement with pure white colour and having same properties as those of ordinary Portland cement. Greyish colour of ordinary cement is due to iron oxide as such white cement is manufactured from white chalk and clay free from iron oxide. Oil fuel and not the coal is used for the burning of this cement. It is much more costly than ordinary cement. White cement is generally used for architectural and decorative purposes and is generally meant for non-structural use. For details refer to IS : 8042-1978. By mixing suitable pigments ordinary Portland cement could be given red or brown colour. For other colours 5 to 10 per cent of desired pigments are ground with white cement. Pigments used in cement should be chemically inert and also durable so as not to fade due to the effect of light, sun or weather. Portland pozzolana cement is produced either by grinding together Portland cement clinker and pozzolana, or by intimately and uniformly blending Portland cement and fine Pozzolana. This cement has properties similar to those of ordinary Portland cement, and can therefore be used for all general purposes where the latter is employed, with no change in the proportion of coarse or fine aggregates and cement. Gypsum is added in both cases. Portland Pozzolana cement produces less heat of hydration and offers greater resistance to the attack of aggressive waters or sulphate bearing soils than ordinary Portland cement. It also reduces leaching of calcium hydroxide liberated during the setting and hydration of cement. Concequently Portland Pozzolana cement is particularly useful in marine works and also in mass concrete structures. Pozzolana cement takes a little longer than ordinary Portland cement to gain strength. It is recommended that when Pozzolana cement is used in reinforced concrete, the centering be left in position a little longer than would be the case with ordinary Portland cement. Ultimate strength of this cement is more than that of ordinary Portland cement but initial and final setting times are the same. For details refer to IS : 1489-1976. It is a product obtained by intergrinding a mixture of Portland cement clinker with inert materials (non-pozzolanic) such as lime stone, conglomerates and dolomite; and gypsum and an air entraining plasticizer. It is primarily used in mortars for general purposes masonry. It is NOT for use in structural concrete, for flooring and foundation work or for reinforced and presetressed concrete works. Masonry cement is a product obtained by intergrinding a mixture of Portland cement clinker with inert materials (non-pozzolanic) such as lime stone, conglomerates and dolomite; and gypsum and an air entraining plasticizer. Its initial setting time is not less than 90 minutes and the final setting time is not more than 24 hours. For details refer to IS : 3466-1967. It compares favourably with ordinary Portland cement in strength and other physical properties but gives lesser heat of hydration. It is chemically resistant to attack of sulphates. It is useful for marine works, mass concrete works to resist attack of agressive waters, for reinforced pipes in ground water; concrete constructions in sulphate bearing soils, in chemical works exposed to high concentration of sulphates or weal solutions of mineral acids, underside of bridges over railways and concrete sewers carrying industrial wastes. It is best used for use in tropical conditions where temperature is below 40ºC. Its initial setting time is not less than 30 minutes and the final setting time not more than 10 hours. For details refer to IS : 6909-1973. It does not deteriorate very little during prolonged storage under unfavourable conditions. It is obtained by intergrinding ordinary Portland cement clinker with certain hydrophobic agents which impart water repelling properties to cement by forming a water repellant film around each particle of cement. The film is broken by striking of particles with each other during mixing of concrete. The cement floats on water for a period of not less than 24 hours. Compressive strength of this cement is the same as of ordinary Portland Cement. For details refer to IS : 8043-1978. 13. High strength ordinary Portland cement. It specifically meets the needs of certain specialized works, such as prestressed concrete and certain items of precast concrete, where cement having compressive strength much higher than that of ordinary Portland cement specified in IS : 269-1976 are needed. This cement is used by Indian Railways for the manufacture of prestressed concrete sleepers etc. Its initial setting time is not less than 30 minutes and final setting time is not more than 10 hours. For details refer to IS : 8112-1976.